Set a Budget. It can become confusing and upsetting for a child to receive a surplus of lavish gifts from one parent while only receiving a few, simple gifts from the other. It can cause the child to equate gifts with love, which is not a lesson anyone should want to teach a kid. It may also create resentment between the parents. When both parents have substantial means, it may create competition and the dual purchase of unnecessary, excessive gifts. However, spoiling a child will likely result in overindulgence, which can, in turn, lead to numerous bad outcomes. To curb the potential for competition or skewed gift-giving, parents should attempt to agree upon a reasonable budget before the holiday season. This recommendation could be extended to birthdays as well. Divide and Conquer. As the child becomes older, they're more likely to create their own wish list. To avoid the possibility of purchasing duplicative gifts from the same list, the parents should divide the items on the list. This can be accomplished by alternating the selection of items from the list or by each parent ranking the items they wish to purchase from the list and dividing the list accordingly. If this method is used, the parents should also set an overall budget so the child is encouraged to create a reasonable list and neither parent is financially overwhelmed. Parents should attempt to coordinate the purchase of complimentary gifts (such as two or more items within a single set) and communicate with each other if they decide to stray from the list. This method allows both parents to buy gifts selected by the child without requiring the creation of two separate lists or causing the child disappointment by the receipt of identical items. Alternate Responsibilities. Another suggestion in dividing this stressful task is to alternate responsibility for the purchase of gifts. For instance, one parent can buy all gifts in odd years and the other parent can buy all gifts in even years. Alternatively, if the parents have more than one child, they can allocate the parent’s purchase of gift to a particular child and swap responsibilities on an annual basis. However, in this scenario, all gifts should be from both parents or “Santa” every year. This will eliminate any competitiveness or potential resentment from the child if one parent chooses to spend excessively in their designated year. Again, the parents should strive to set a budget if each parent is allocated to purchase gifts for a different child, so as to eliminate any discrepancy between siblings. 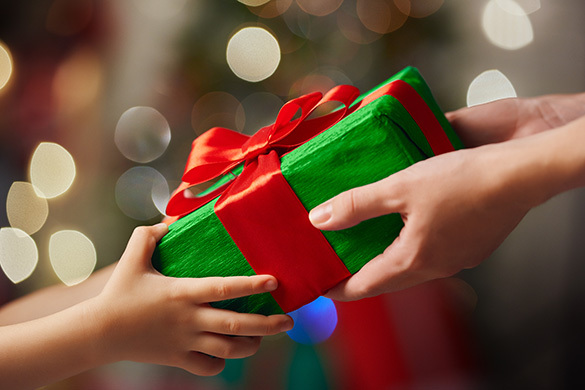 To reduce the potential for the parent purchasing gifts to keep the “better” presents in their household, it is suggested that one parent strive to create two equal lists of all the gifts purchased and thereafter, permit the other parent to select which list of gifts they will retain for their household. Alternatively, both parents can celebrate the holiday together with the child, but we recognize this isn’t a viable option in most situations. Make Experiences. For parents on a strict budget, a welcome present may actually be as simple as being “present.” You can create an experience with your child without the accompanying expense. For instance, choose your child’s favorite holiday movie and set up an indoor movie theater experience in your living room, complete with popcorn and other theater snacks. Another idea is to tour the exteriors of houses in the area displaying the best light displays. For some ideas of inspiration, check out this link. Again, parents should attempt to coordinate their special plans and if possible, share any memorable experience together, such as the child meeting Santa. Being separated or divorced during the holidays should not cause unnecessary stress or anxiety for the child. Both parents should work collaboratively together; particularly, during this time of year. If parents agree on the best method to purchase gifts for the child, a clause should be incorporated into the Custody Agreement as this will eliminate the likelihood of it becoming an issue in the future. Of course, we realize this isn’t possible in all cases and are prepared to address these issues, as required by the circumstances of each client’s unique situation. If you would like to speak with an attorney to discuss any concerns you may have in relation to any parenting or custody issues, please call Ruvolo Law Group to schedule a consultation.